Siam, Bangkok, Thailand. Image Credit: Twang_Dunga / CC by 2.0. 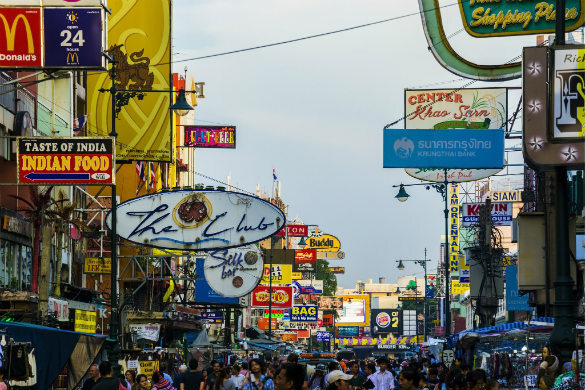 Perhaps best known for its great shopping, there’s more to Siam than just great opportunities to give your credit card a work out. In addition to the shopping centres and trendy retailers scattered throughout the neighbourhoods, you’ll find plenty of activities and attractions suited to the whole family. Home to a BTS Skytrain station, Siam provides easy access to the rest of the city. Head to the Bangkok Art and Culture Centre and feast your senses on the city’s widest collection of contemporary art and design. Keep an eye out for concerts, film screenings and other engaging events that offer a great insight into Bangkok’s creative arts scene. Wander through the grounds of Wat Pathum Wanaram. Founded in 1857, this Buddhist temple sits between two shopping centres, just across from Siam Square, yet offers an air of peace and serenity in the midst of the city. See over 30,000 captivating marine creatures up close at SEA LIFE Bangkok Ocean World. One of the largest of its kind in Southeast Asia, the aquarium is located two storeys beneath the Siam Paragon shopping centre. What’s in Siam? Good shopping and a wide assortment of attractions encompassing everything from aquariums and art galleries through to serene religious sites. Stay in Siam if… you’re travelling with your family or are seeking somewhere that’s safe but within easy access to some great attractions. Benjakati Park, Bangkok, Thailand. Image Credit: Annika Thielemann / CC by 2.0. Perfect for a first time visitor, Sukhumvit is a neighbourhood that’s centrally located and offers easy access to the districts that surround it. Providing a good introduction to the city, across Sukhumvit you’ll find world-class shopping, delightful green spaces and a touch of cosmopolitan charm. With a variety of experiences to be had throughout the neighbourhood, it’s a great place to enjoy your first taste of Bangkok life. Shop up a storm at Terminal 21. This airport-themed shopping centre is divided into several ‘destinations’, allowing to shoppers to wander through recreations of London’s Carnaby Street, downtown Tokyo, a Turkish souk and more. With around 600 stores scattered across nine storeys, there’s plenty of opportunities to shop ‘til you drop. Take a stroll through Benjakiti Park. One of the city’s most popular parks, it’s a great place to head if you’re seeking a break from busy downtown Bangkok. Soak up some great city views, set out on a quick jog or simply sit back and enjoy this delightful green space. Browse through the stalls of Sukhumvit Street Market. Held every night from around 5pm to midnight, you’ll find all manner of goods on sale, from souvenirs to clothing. What’s in Sukhumvit? Markets, shopping centres and plenty of historic and cultural attractions. Stay in Sukhumvit if… you’re planning to visit Bangkok for the first time. Khao San Road, Bangkok, Thailand. Image Credit: Guillén Pérez / CC by ND 2.0. A favourite among backpackers and budget travellers, Khao San Road is perhaps one of Bangkok’s liveliest neighbourhoods. Home to an abundance of bars, low cost accommodation options, no shortage of tasty street food and plenty of markets, there’s so much to see and do without blowing your holiday budget. Close to some of the city’s top attractions, it’s a great place to base yourself if you’re wanting to spend your hard earned cash wisely. Popular with young tourists and those travelling on a budget, Khao San Road is home to plenty of bars. Party the night away, enjoy a drink at a rooftop bar or simply see where the night takes you. Discover the shops and stalls that line Khao San Road. During the day and after dark, the road plays host to permanent stores, pop-up stalls and all manner of vendors. Grab some new clothes, try some local delicacies or pick up a souvenir or two. Enjoy a spot of people watching. Lively at any time of the day, the road attracts a wide variety of visitors from across the globe. From foreign backpackers to local kids and Buddhist monks, it’s interesting to just stop and watch on as people go about their day. What’s on Khao San Road? Plenty of bars, some great shopping opportunities and a vibrant atmosphere day and night. Stay on Khao San Road if… you’re travelling on a tight budget or are looking to party the nights away. The Grand Palace, Bangkok, Thailand. Image Credit: mmmmngai@rogers.com / CC by SA 2.0. 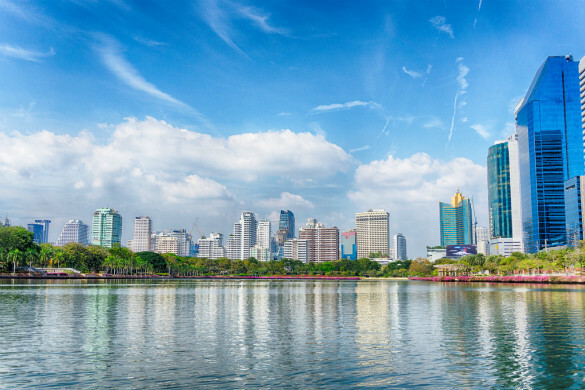 Home to some of the city’s luxury hotels and resorts, the Bangkok Riverside is one of the more expensive districts to stay in. Positioned alongside the Chao Phraya River, it also boasts an abundance of iconic attractions, including Wat Arun and the Grand Palace, and no shortage of fantastic water views. Providing an interesting contrast between the city’s modern incarnation and its rich heritage, you’ll find plenty ways to while away the hours throughout the area. Perhaps best known for the tiled spire that stands high above the riverside, Wat Arun is one of the city’s grand Buddhist temples. Explore the grounds and admire the beauty of its unique decorations. 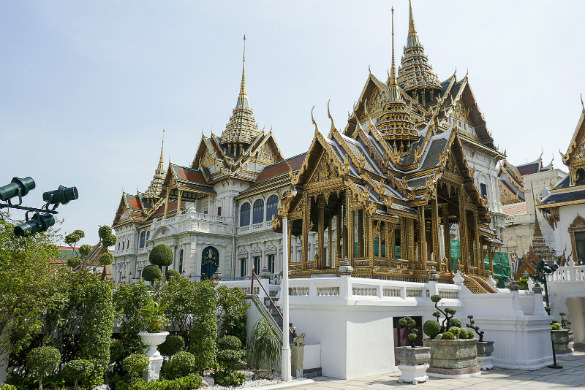 Boasting some spectacular architecture, you shouldn’t miss the Grand Palace. One of the city’s most popular attractions, the palace served as the royal residence from the late 18th century through to the 1920s, with four buildings and its grounds now open to the public. Spend time exploring the Bangkok Riverside. Whether you’d rather a nice waterside walk or a drink with a view, there are plenty of great ways to experience Bankgok’s main waterway. What’s in the Bangkok Riverside? Grand buildings, plenty of local history and some great river views. 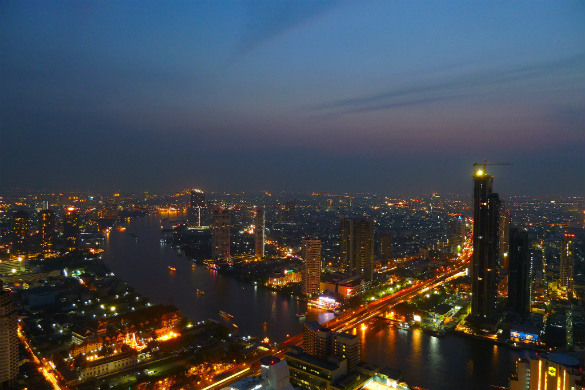 Stay on the Bangkok Riverside if… your seeking more luxurious accommodation or are wanting to treat yourself. View from Sky Bar at Lebua State Tower, Bangkok, Thailand. Image Credit: Daniel Peherstorfer / CC by 2.0. 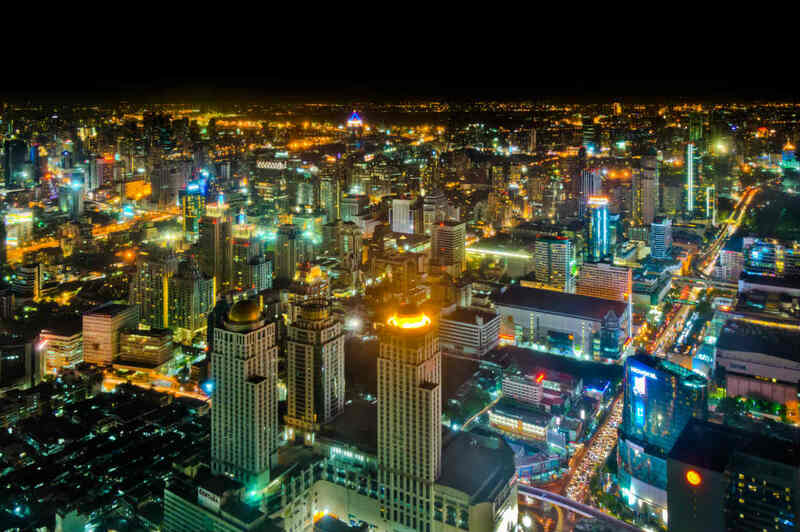 One of Bangkok’s prominent financial districts, Silom is considered by many to be one of the best places to stay in the city. Relatively lively at night, the area features some great restaurants, an assortment of attractions and the famed party scene of Patpong. Generally quieter than some other parts of the city, it’s a good place to base yourself if you’re wanting to base yourself close to the CBD. Another of Bangkok’s green spaces, Lumpini Park is a favourite among locals and visitors alike. Take a walk by the lake, hire a paddle boat and enjoy some time out on the water, or get involved in one of the many organised activities held within the grounds. Admire the beauty of Sri Mahamariamman Temple, a Hindu place of worship adorned with intricate carvings and plenty of vibrant colour. Soak up some spectacular city views at the Sky Bar at Lebua State Tower. Featured in the second film of the Hangover franchise, the bar, found 63 storeys above street level, is often considered among the best of its kind in the world. What’s in Silom? Good shopping, great restaurants and some interesting places of worship. 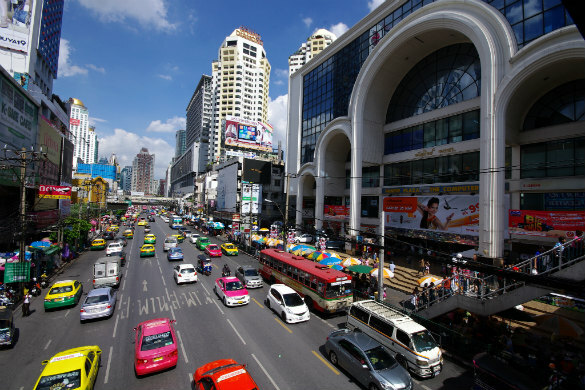 Stay in Silom if… you’re wanting to stay close to the centre of the city or are planning a return visit. Heading to Bangkok? Find flights, hotels and more with Webjet today! Feature Image Credit: Mathias Krumbholz / CC by SA 3.0.